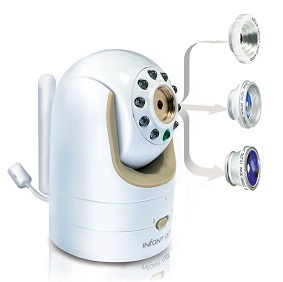 This cute looking Infant Optics baby monitor has just about everything you need in a baby monitoring device. 10 battery life in standby mode. Separate wide angle lens can be purchased separately. You have three different lenses, just like a normal camera. The Infant Optics DXR 8 is shipped with a normal lens and a zoom lens and you can purchase a wide angle lens separately (170 degree angle). This means that you can select the best viewing angle for your circumstances. 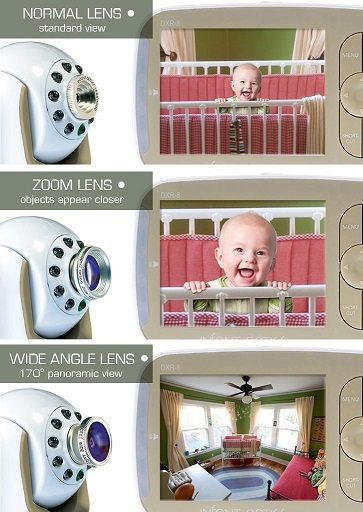 For example, you can use the normal lens while your baby is young and then switch to a wide angle lens when they begin to crawl and move around. With the Infant Optics DXR 8, you will receive real time video and sound from the nursery, so you will be instantly notified when your baby is awake. The IR night vision is a handy feature, keeping you aware of your baby’s sleeping patterns during the evening and overnight. 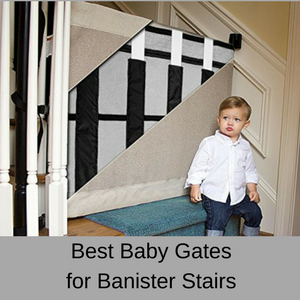 Even better, the screen will go into standby mode after a set time period, but the audio function remains active, so you don’t waste the battery and keep your baby awake with a bright screen. 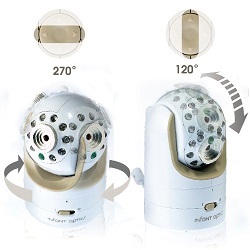 A nice feature of the Infant Optics DXR-8 video baby monitor is the temperature sensor, which lets you know the ambient room temperature, so your baby is kept nice and comfortable. 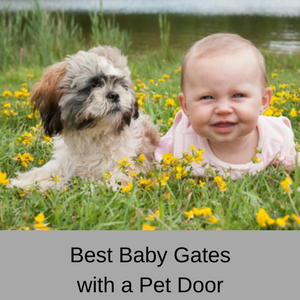 You can also have the sound on or off and if you switch the sound off, you can monitor your baby using the LED display, which changes depending on the strength of your baby’s sounds. The Infant Optics DXR-8 has both a pan and tilt function as well as a lens zoom, both of which are are remote controlled. 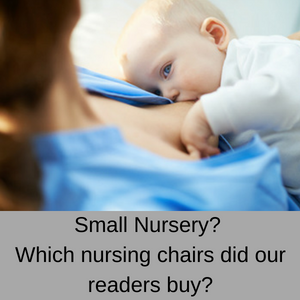 This means that you can zoom in on your baby and check on them without disturbing their sleep, as well as following toddlers around the room with the pan and tilt, if they are scampering away from your field of view. 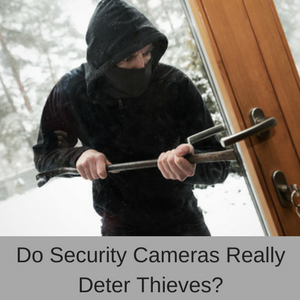 You can link up to 4 cameras to the Infant Optics system and you can automatically cycle through the cameras every 12 seconds, giving you virtually continuous monitoring and audio surveillance in multiple rooms. You can also mute one camera and keep the sound detection on another camera, which is great if you have more than one baby or toddler to monitor in different rooms. Another useful function is that the video can be switched off and instead, you can just use the audio function. Yet another brilliant feature is that the Infant Optics DXR-8 is easy to take with you on holiday and set up when you are travelling. Finding the right spot to place the camera in the nursery is easy, because the DXR-8 baby monitor can be wall mounted or placed on a dresser or shelf in the nursery. The camera does need to be plugged into the mains however, (so it needs to be close enough to an electrical outlet), but the handheld unit can be run on battery. 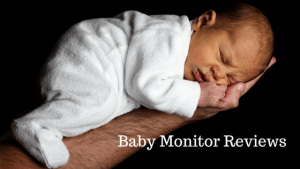 The Infant Optics DXR-8 is a closed unit, meaning that it does not need WIFI and you can only monitor your baby using the handheld unit, you cannot use a smart phone or an iPad. There is an out-of-range warning, a low battery warning, and volume and brightness controls. 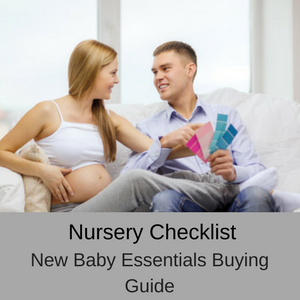 Make sure your baby is safely sleeping in the nursery at night. 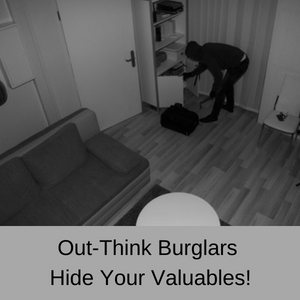 Keep an eye on them when you are busy in another part of the home. Monitor your elderly relative, so they are always safe in your home. Battery: The handheld monitor has 1 lithium ion battery which gives you 10 hours on power saving mode and 6 hours with the screen in use. You can charge the monitor using a USB connection or from mains power. Power supply: Power is 100-240 V at 50/60 Hz and the camera has to be plugged into the mains to operate. 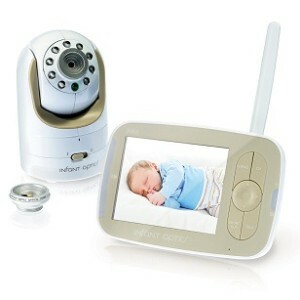 Zoom: This baby monitor comes with an optical zoom lens (x2), but a wide angle lens can be purchased separately as well. Pan and Tilt: Yes, 120o up and down and 270o left and right. Live feeds/Remote monitoring: Real time video streaming and remote viewing for up to 700 ft.
Antenna: This model has a retractable antenna. Range: 700 feet in unobstructed conditions. Screen size: Large 3.5 inches. Pixels: 640 x 480 VGA. Built in lens: f 2.5mm, F 2.8. Color images: Full color LCD display. Sound detection: Yes. Sound activated LED display. Power cords: Yes, the power cable for the monitor is 10ft and for the camera is 8.5ft. The plugs are specifically for the US, so if you live elsewhere, you will need to purchase a power converter plug. The DXR-8 has many more features than the more basic DXR-5 model, but it is also a little more costly. 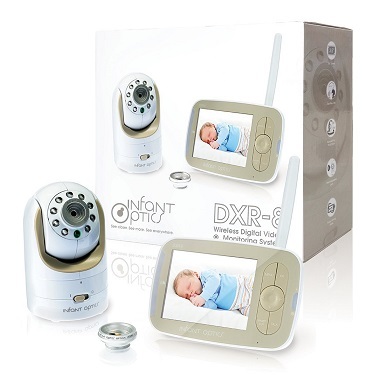 If you just want a buget model then the sturdy DXR-5 is a great little baby monitor, but for more functions you need to go with the DXR-8. Remember, you cannot combine these two baby monitors in the same system. So if you already have a DXR-8 baby monitor and you need to expand your system, you need to purchase another DXR-8 monitor, not a DXR-5 and vice versa. Pros: There are nearly 2,500 Infant Optics DXR 8 reviews on Amazon and more than 80% of have given the Infant Optics DXR-8 baby monitor a 4 or 5 star rating. Customers liked the pan and tilt facility which was easy to use remotely, the images were crystal clear and the battery life is great. The two-way sound is also a fabulous feature and it is easy to install and to use. Customer support is also great and they are very helpful and quick to respond. Customers seem to love this baby monitor. Video is crisp and sound is great. Works well around the house and keeps the charge for a long time. Works amazing clear picture, works good at night and distance is amazing works perfectly from baby room into garage across the house. 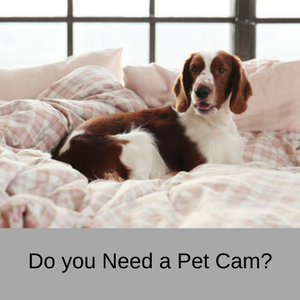 Great camera, easy to use and set up! Great product…I love this camera. Great customer service too. Cons: Only 7% of the Infant Optics DXR 8 reviews gave this baby monitor a one star rating, mainly because of problems with beeping sounds, however the new firmware has resolved this problem. The main complaints seem to be about a loss in signal and the loud beeping alarm that notifies you of this signal loss – which is fixed now. Apparently, this problem can be resolved by moving any 2.4Ghz devices at least 3 ft away from the monitor (Internet TVs, routers and smartphones). Some customers also complained that the camera interferes with their home WIFI, but keeping the baby monitor and your router separate seems to do the trick. 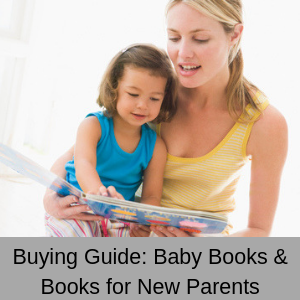 Australia Shipping: This product does not ship to Australia – for overseas shipping options see my Shipping Guide. The Infant Optics DXR-8 baby monitor is well liked by customers and has just about every feature you could possibly want in a monitor. There have been some problems with a loss of signal and interruptions to home WIFI, but the manufacturers suggest that this is due to the nearness of other internet devices operating on the same wavelength. Overall, this is a nice little baby monitor that has lots of great features – and fabulous customer support. If you found my Infant Optics DXR 8 Review helpful, you can read more of my reviews here.